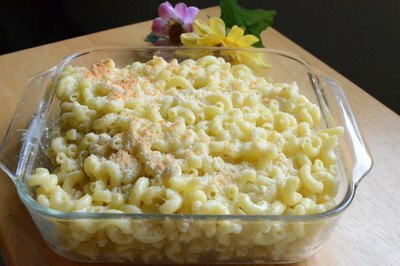 For many people, macaroni and cheese is comfort food, whether it's baked at home in the oven or on the stove from a box. Originally imported from Italy and a part of American cuisine since colonial times, macaroni and cheese recipes depend on melting cheese into a bechamel sauce (milk, butter and flour). If you don't have milk or you prefer not to use it, you can find other ways to achieve the thick cheese sauce. 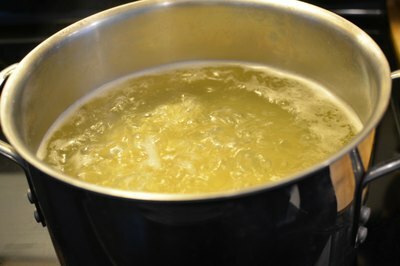 Cook macaroni in pot of boiling water over the stove until al dente, about 10 to 12 minutes. 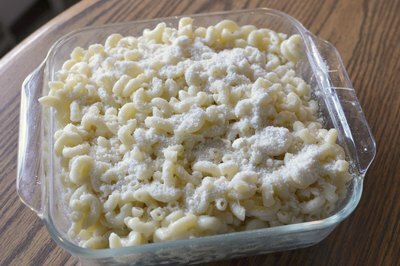 While the macaroni cooks, grease the baking dish and assemble all other ingredients. Drain the pasta when it's done cooking and return it to the pot. Toss the pasta with the butter, salt, pepper, fontina, mozzarella and 3 tbsp. of the Parmesan. Stir and toss until butter and cheeses are melted and a sauce forms. 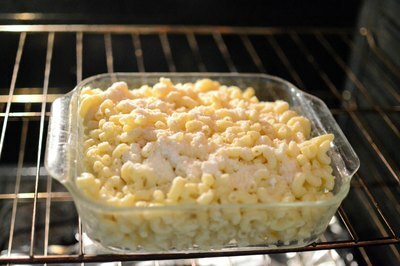 Preheat the broiler and transfer the macaroni to the baking dish. Sprinkle the remaining 3 tbsp. of Parmesan over the top. Broil the macaroni for 3 to 4 minutes until the top starts to brown and the cheese bubbles. Serve with additional Parmesan as desired.